There are many ways to create a double-welt pocket, but this is my favorite for a very fast and easy pocket. This method involves no measuring (that’s right! 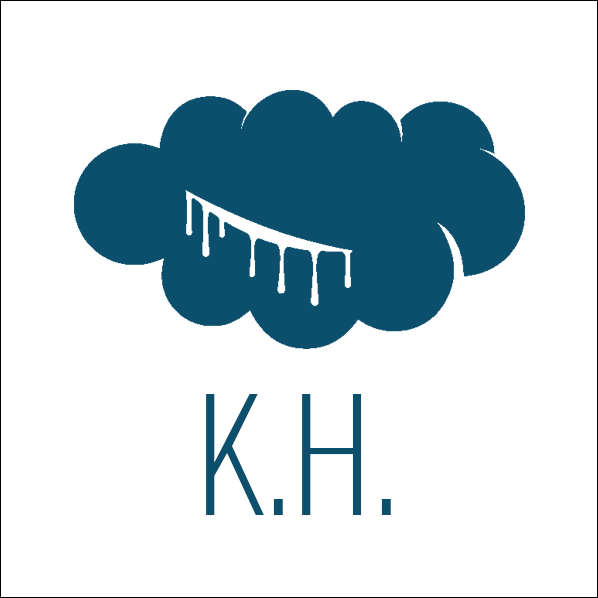 ), and no interfacing. Best of all, it’s really easy to memorize. 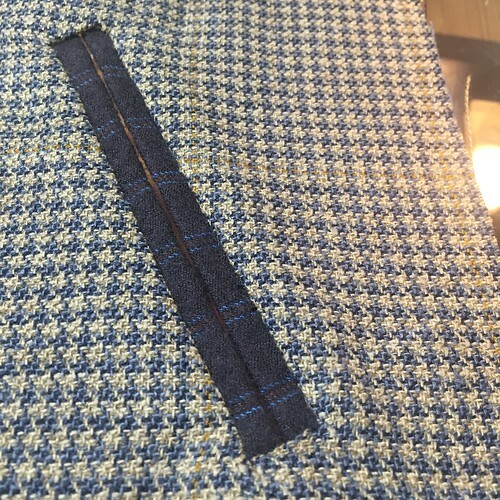 This translates to great-looking welt pockets that come together very quickly. 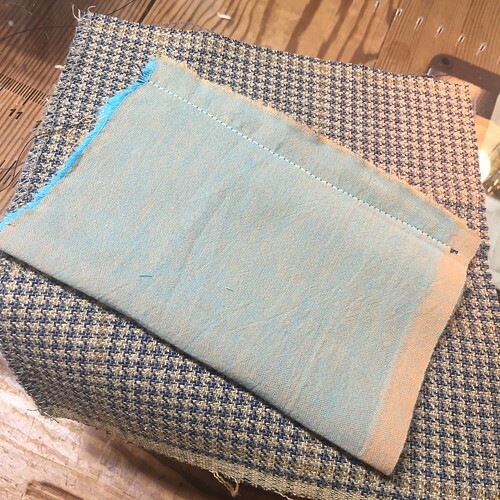 This method is also ideal for very spongey, thick, or wonky fabrics that don’t respond well to fiddling. I came up with it after dicking around for wayyyyyy too long with this perfectly lovely ponte that was bulky and terribly susceptible to pressing transfer. This method only needs a few supplies! 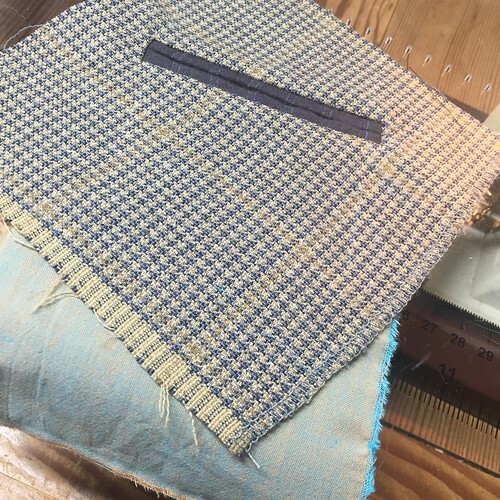 At left: shell fabric (houndstooth), pocket bag (shot cotton), and welt fabric (typically the same for shell but, for the sake of this tutorial, a dark brown). You also need 7/8″ grosgrain ribbon,basting spray (or gluestick), and marking chalk. 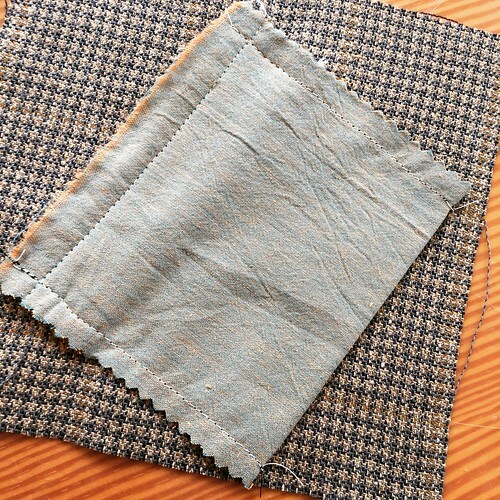 I like to use a fine cotton, as I like to tear (not cut) my pocket bags. Very fast, very accurate. 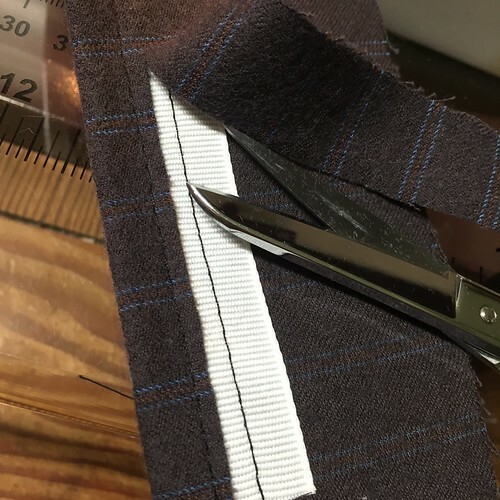 If you use satin or some other foolishness, you will need to cut. 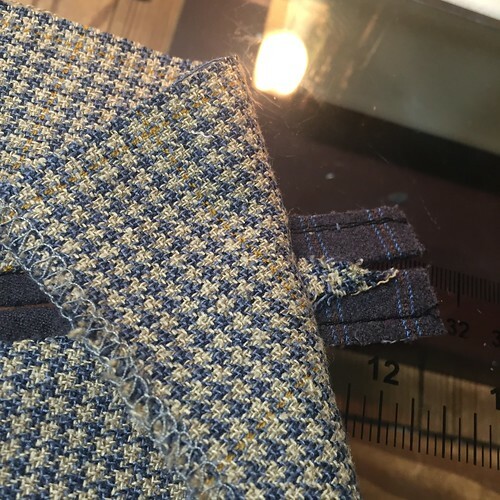 As with any welt pocket treatment and any new technique, please make a sample first! 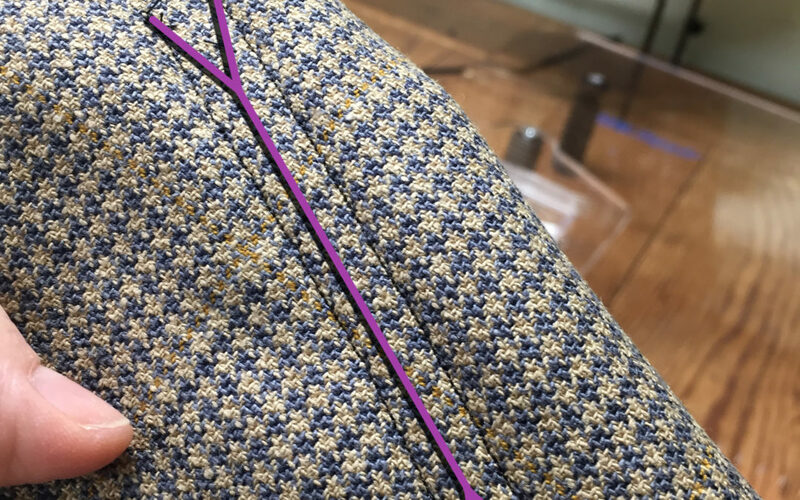 Cut a piece of ribbon that is at least 2″ longer than your pocket. 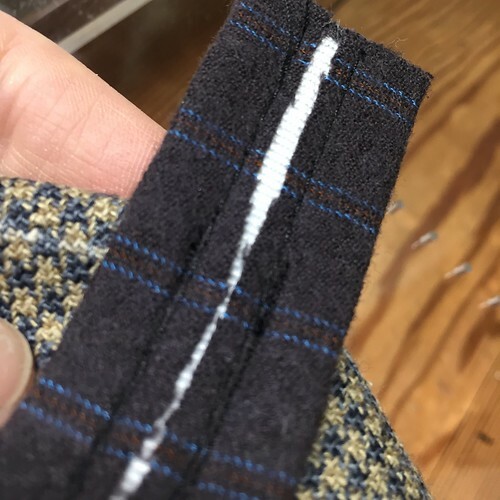 Lightly spray the grosgrain on one side, and lay the ribbon along the crossgrain of a piece of welt fabric, making sure the welt fabric is about 4″ wide. 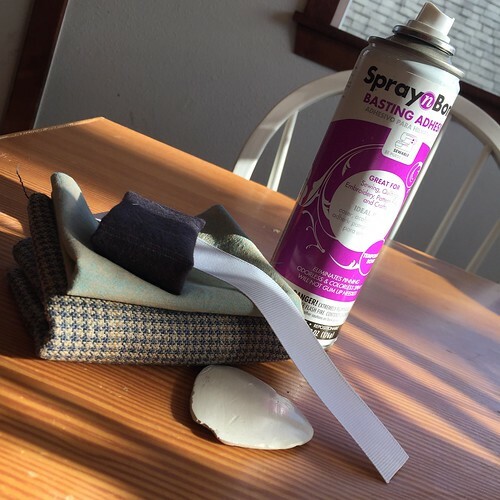 Pro-tip: I spray by placing the ribbon in my wastebasket, so the trash liner catches any overspray. 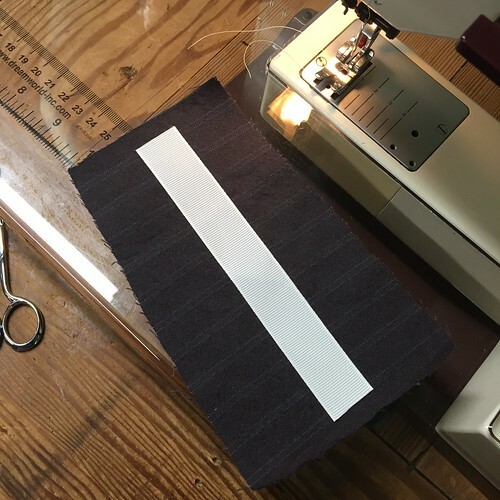 Next, sew two channels a generous 1/4″ from the grosgrain edge, using a basting stitch. 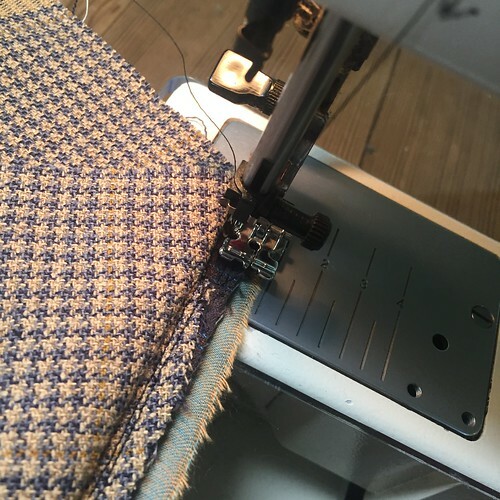 I like to stitch in the same direction for both channels. 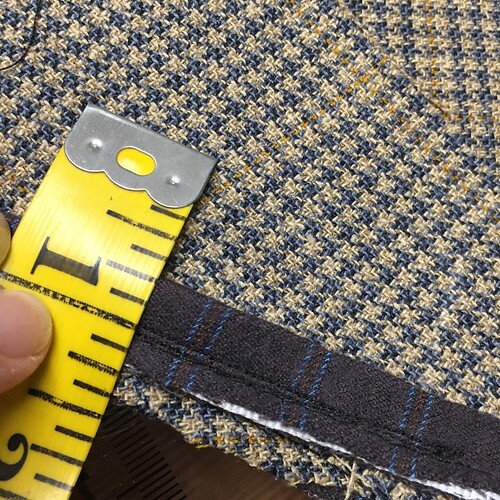 You don’t want to stitch any closer to the edge than this 5/16″, or the threads may show in the welt lips. 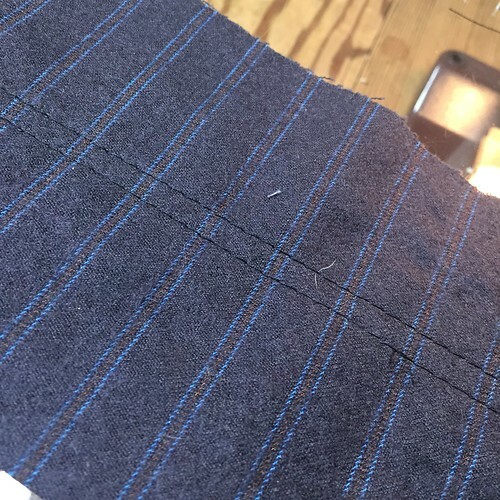 Now, we’re going to stitch the welt to the garment – think two parallel lines (NOT a rectangle). 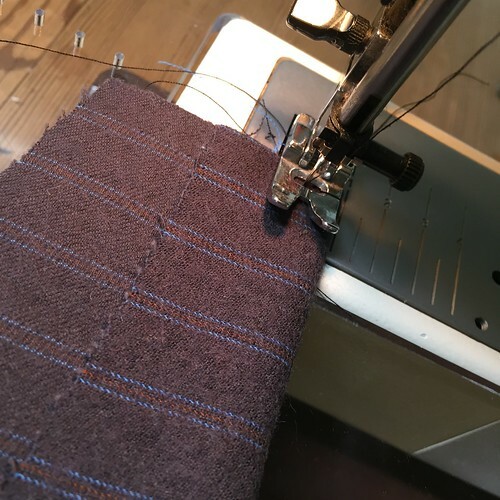 Stitch right on top of those previous 3/8″ stitching lines, making sure to stop and carefully backtack right at the ending marks of the pocket. 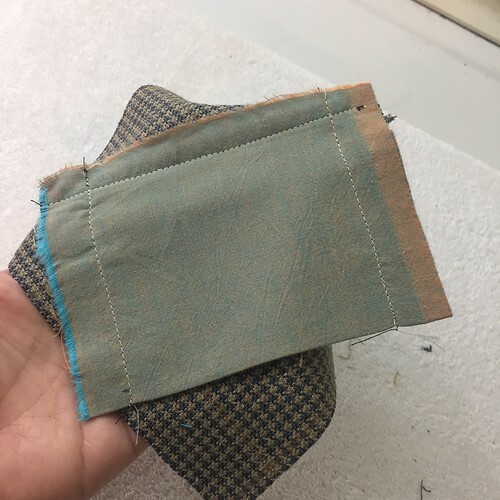 Unless the fabric is very shifty indeed you can confidently backtack – but if you are worried, leave long tails at these four ends, pull the ends to the welt-side after stitching, knot, and secure the thread tails in the welt. Here is the backside of the work – two parallel lines. Make sure to double check before proceeding. 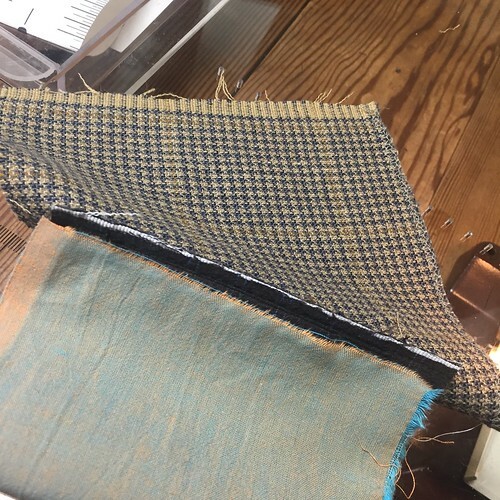 Next, you want to cut from the backside, catching only the shell (not the welt). 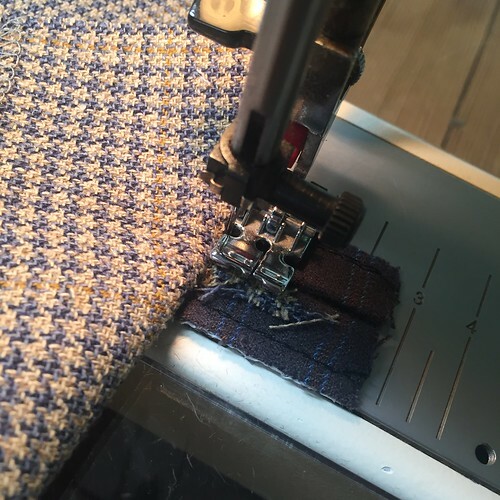 You want to cut to the stitching lines, and right exactly to those stitching lines. Make sure to make a very long triangle at these ends. 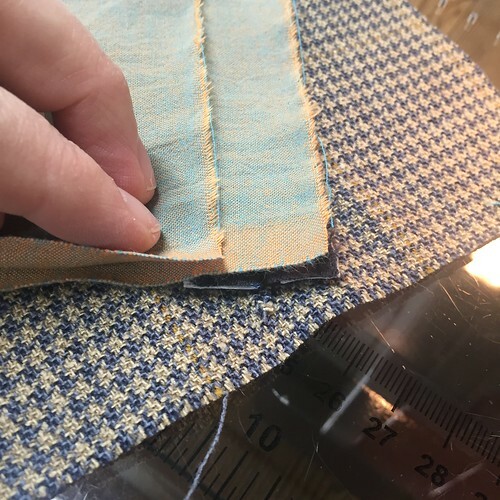 I like to start cutting at the triangle point that intersects the center line, and cut right to my stitching lines using a very sharp scissor. Then I cut the center line. 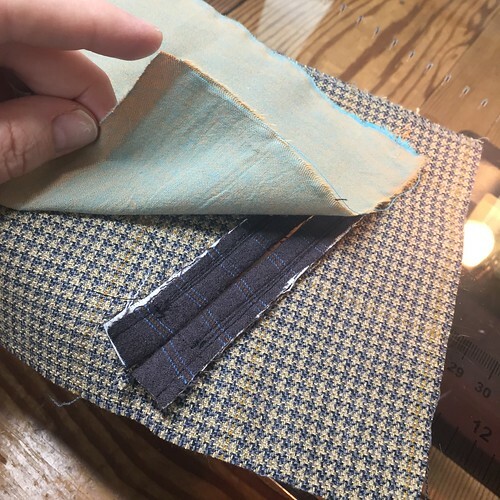 So go ahead and flip your shell back and, using a zipper foot (or not, but it’s handy), stitch that triangle right to the welt. The ribbon will help the welt lips lie wonderfully close together. Repeat with both sides. Time for the pocket bag! Two things, before we proceed. 1. 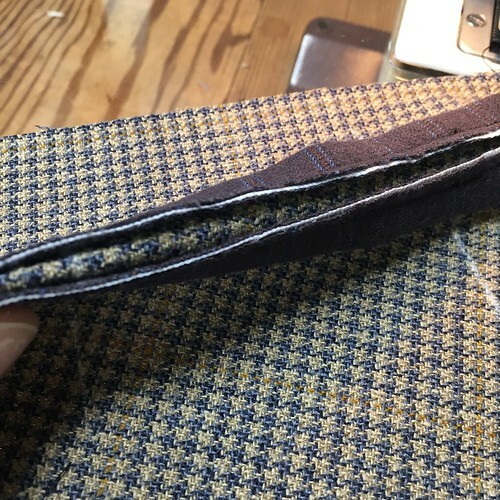 If you want, you can tear or cut a shell facing strip, to put at the top right side of the pocket bag. 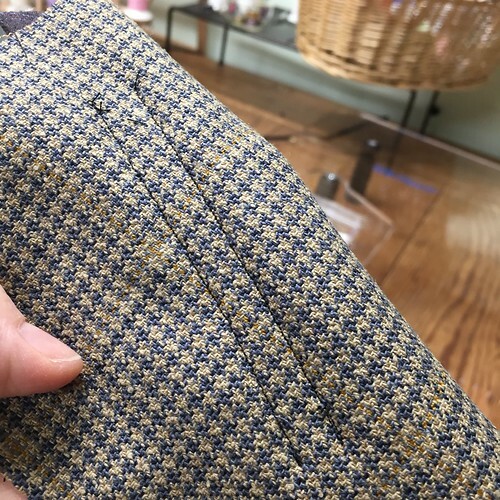 This is pretty standard, especially for a pocket that may gape. 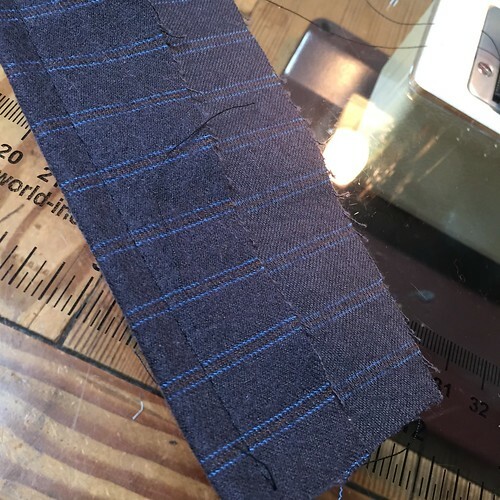 For kidswear or casual wear or a small pocket, I don’t add the facing bit as it is unneccesary and adds bulk, and pocket gap is not an issue. 2. 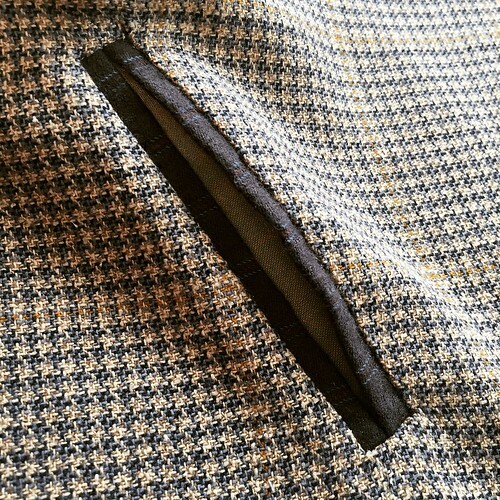 This pocket treatment looks gorgeous enough it does not need a lining to obfuscate it. That said, the only application I would install these without a lining, would be the back of trousers. 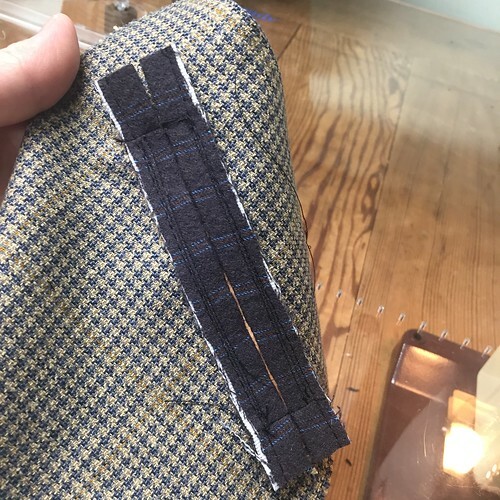 In that case, make sure your pocket bag strip is very long, so you can bring up the top edge to later snug it into the waistband of the trouser – a really classic look. Now how long do you make the bag? 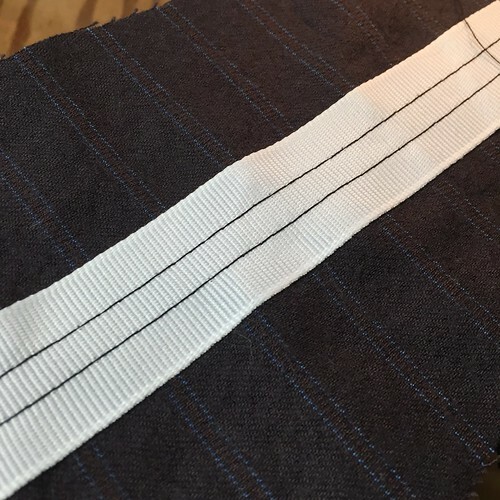 Well I like to measure such that the torn bottom edge overlaps the bottom raw edge of the welt by 1/4″, and the fold is no deeper than the bottom edge of the garment (obviously). If this is confusing you, don’t worry. 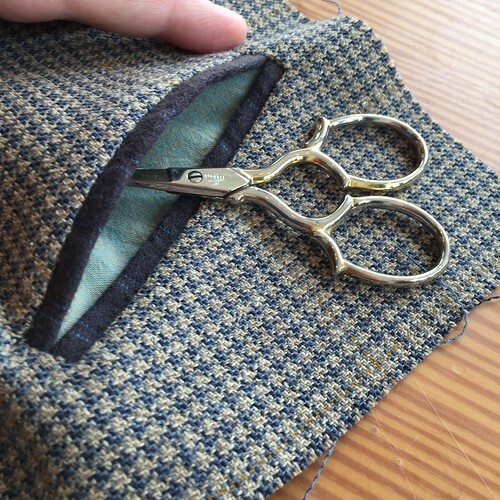 If your pocket bag ends up too long, because you can always stitch it shorter. 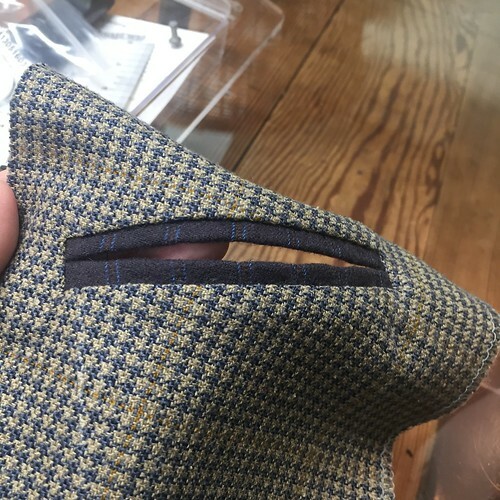 I love the neat look of the fold at the pocket bag bototm, but it’s also standard to stitch a U-shaped curve and cut the fold off. 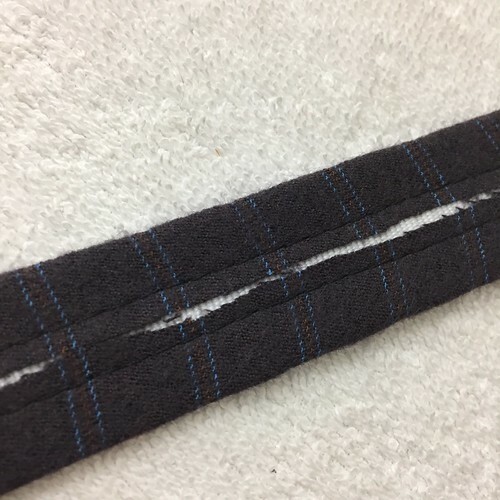 Reminder: that torn edge at right, on the trouser application I described above, will extend much further than the top welt raw edge. 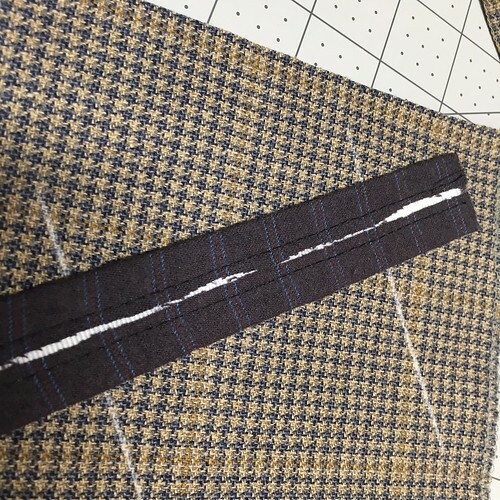 You can leave these side seams as they are, or pink them. 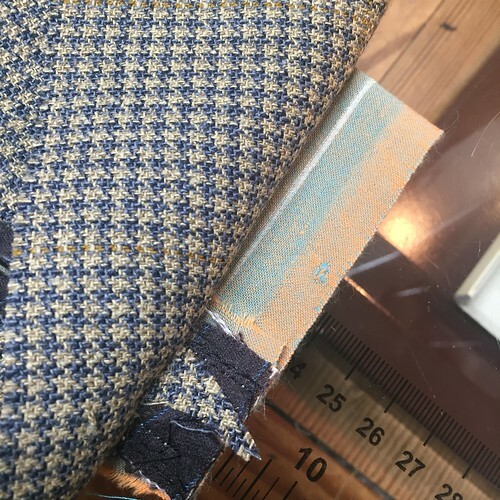 If I was using a trouser application, I’d probably pink, bind or serge them, depending on the weight of my trouser fabric (this houndstooth is too thin for binding). 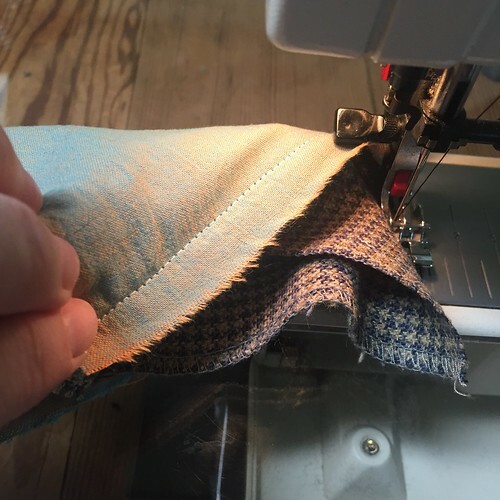 I love these tutorials and close-up descriptions/dissections of your sewing, Kelly. I enjoy reading them, even though they are far past my current skill level, and learning about the intricacies involved in making stellar garments. Thank you for doing them. My best to you all.